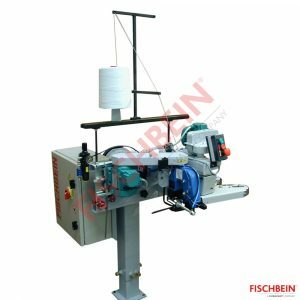 The mini-system FTS is used to close, by plain sewing, all types of bags (paper, polypropylene, or polyethylene) by plain sewing. The already reshaped bag is introduced into the infeed which guides the bag to the sewing machine. The sewing process starts when the feeler switch is activated. At the end, the pneumatic chain pusher pushes the chain into the knives to cut it. To have a smooth operation of the mini system a conveyor is required. The conveyor can be controlled by a footswitch. The mini-system FTS operates automatically for small outputs up to 250-300 bags/hour. Other models of mini-systems are available.